An extension of UIPageViewController to allow adding Views to a Page View directly in your Storyboard, without any additional code. Just create your Page View Controller in storyboard, add a few segues, and you have a working set of paged views. TEQuickPageViewController supports Page Curl and Scroll transition types, as well as a two-page view with a Spine Location of "Mid". See CHANGELOG.md for a full list of changes in each version. Add a custom segue between your Page View Controller and the new View Controller. Set the segue's class to TEQuickPageViewSegue and the Identifier to "page"
To add a second page, just drag another View Controller into your view and add another custom segue with the same settings, this time from your first page. This will create a chain of pages in your storyboard. 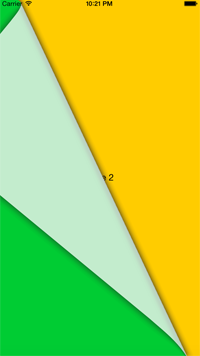 You'll probably have noticed the ugly black bar that appears at the bottom of your view when using the scroll transition. To get rid of this, you can set up your TEQuickPageViewController to extend your pages across the entire view. Just open the Attributes inspector of your TEQuickPageViewController and set "Extended Page" On. You may have seen in the above screenshot for Extended Pages that there are color options for "Indicator Tint" and "Indicator Current". 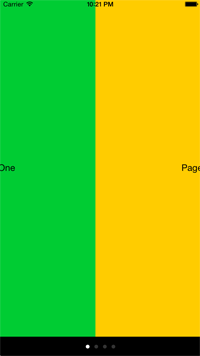 These control the color of the unselected page indicators and the currently selected page indicators respectively. The Wrap Around attribute in your TEQuickPageViewController's attributes allows your pages to "wrap" from the end back to the beginning. When disabled, the user will not be able to swipe backwards from the first page or forwards from the last page. By default, your page segues need an identifier of "page", but this may not be desirable. To specify your own identifier, just set the "Segue Id" attribute on your TEQuickPageViewController. You can now change the identifier for your segues to this string. If you have a cycle in your chain of pages (such as connecting Page 1 -> Page 2 -> Page 1), this will result in an infinite loop when establishing the array of pages, and our app will crash. It should be easy to see if you have a loop in your chain, and remove the problem segue. TEQuickPageViewController.xcodeproj is a simple iOS app making use of the TEQuickPageViewController class. Feel free to open it up and play around! TEQuickPageViewController is available under the MIT license. See the LICENSE file for more info.